Welsh Harlequin ducks were developed by Leslie Bonnet of Wales from a colour mutation that showed up in his Khaki Campbell ducks in 1949. Over time they became a little larger than the Campbells, with the adult drakes weighing around 2.5kg. They are primarily an egg laying breed - the ducks should lay at least 240 eggs per year. The young drakes make high quality medium sized roasters. As you can see in the picture, they are also very decorative. 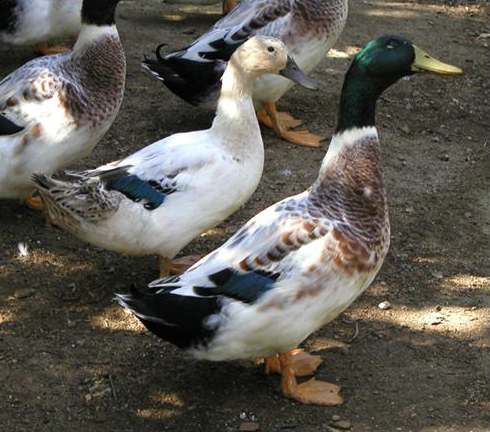 Welsh Harlequins are active ducks and tireless foragers, excellently suited to free range. They always move together as a flock, which has found them a somewhat more unusual niche in training herding dogs. Several people have obtained small flocks from us over the years for that purpose!